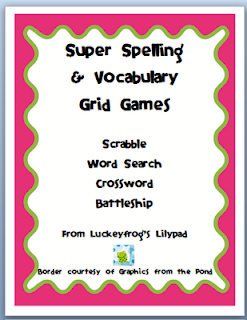 FREEBIE- 8 Fun Ways to Practice Spelling and Vocabulary! At the end of the year, I really try to keep learning until the last day. My principal pushed us to remember that we are given the task of educating our students for 180 days- not 170, not 175, not 179... 180! But the students definitely do start to get squirrely! For me, I wanted to make sure we reviewed a lot of our learning at the end of the year while still giving them an outlet for all that summery energy. This is one that I need to remember to pull out all through the year! This is a simple game called Spelling Scrabble! The students just take turns filling in words in the grid, trying to make them cross another word. 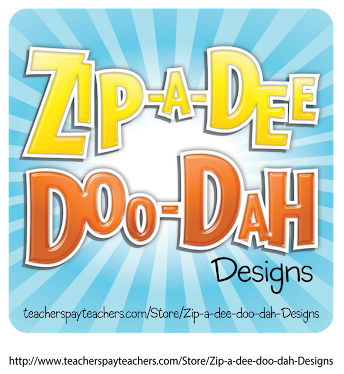 You can play this with spelling words, vocabulary words, or anything else they need to review! I just put up our newsletter with spelling and vocabulary lists on the SmartBoard (if they're not posted on my board for some reason), and they are good to go! You do have to teach them not to "stack" two words next two each other (because it usually makes lots of little nonsense words) and you have to clarify if diagonal is okay or if they can write the word backwards. It's really a simple grid, but it's so versatile for lots of different spelling activities! I've changed the title of the grid for Spelling Scrabble, Vocabulary Scrabble, Spelling Battleship, Vocabulary Battleship, Spelling Crossword, Vocabulary Crossword, Spelling Word Search, and Vocabulary Word Search- and you can get them all here! Laminating these sheets (or sticking them in page protectors) also works well for repeated use with dry-erase markers. It's my husband's birthday! He's in Texas, though, while I'm in Indiana, and I'm sad I can't be with him to celebrate. But in celebration of his birthday, I'm sending HIM freshly baked cookies, and I'm giving YOU a freebie! As I told my students, the principal evaluates me, but she's only in a few times a year. The kids who see me teaching every day can give me valuable feedback. Had I just given them a survey, like I have in the past, I don't think they would've enjoyed it so much. But when I put out "My Teacher's Report Card" as our morning work on the last day, my class LOVED it. 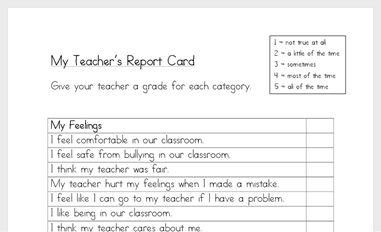 The idea of giving your teacher a report card had them in stitches, but I made them promise they would be honest and help me become a better teacher. They did a great job. Some of the things they said I could improve on were definitely true- but hearing it from them helped me really start thinking about what I will do next year to make that happen. Are you curious what grades your students would give you? One more thing before I go- if you are still looking for a memory book for the end of the year, I have to recommend this free end-of-the-year memory book from Cara Carroll. It's fantastic! We just worked on a couple of pages a day until it was done. It includes an autograph section, so your students who don't get a yearbook don't have to be left out! I also took one of the pages and covered everything but the border to copy a few extra pages in the back for the photos I gave each student. I had the joy of seeing students write things like "I learned it's okay to like pink" or "Now I really like reading" - and the joy of awesome pictures like this one to make me laugh. I slept in yesterday and did NOTHING for school before I came in today, and I just got all of my cume files done. Now, it's time for filing and packing all of my things... not excited! But last year at this time, I was moving out of a school and looking for a new job, so I am extremely thankful to HAVE a classroom next year (and know where I'm living, and not be wedding planning). I'm crossing my fingers for all of you who are still looking! Easy and Cheap End of the Year Gift! School ended for us last Thursday, which meant that last Wednesday, I stayed at school very late. Like, I went to bed at 5:30. I always procrastinate on grade cards, but I was also working on my parent cards and gifts, student gifts, and everything that goes along with the last day! I also had a great last-minute idea (story of my life! ), and I wanted to share it with you so you could work on it BEFORE that last day, if you are still in school. Along with making prints of all of my photos of the year, I had taken a close-up headshot of each kid while they enjoyed someone's birthday snack outside, and I printed one of each. If you are still looking to order photo prints for your class, be sure to check Retail Me Not before you place an order. I found a coupon code for 50% off of my photo order at Walgreens, which saved me $30! I'd also gotten a list of adjectives from the class to describe each student. Basically, each kid wrote their name at the top of a piece of notebook paper and then we played "Scoot" around the room until they had described each of their classmates. I typed in the adjectives at Tagul. You have to create a login, but I found that it was so quick and easy to save the files that it was worth it! It's also completely free. I also typed in each student's name 7 or 8 times, so it would be the biggest. Tagul automatically made the adjectives bigger if they were suggested by a student more than once. You can choose the font(s), color(s), and style of your word cloud, if you want. Then, I saved the files in a folder (all easy to find on my desktop!) and plugged them into a Word file with blue rectangles. To save ink, I put a while square over the part where the picture would go. You could also digitally print the student's picture, of course... I just liked the look of a photo print, and used a glue-stick to put it on. I gave it to the students like this, but next year I may get a dollar store frame for each one. I was so happy with how these turned out! I had seen a Wordle or cloud for students' names and adjectives before, but I felt like combining it with a photo will make a really great keepsake for the kid and their family. On that note... it's time to shower, eat, and head into school to finish my cumulative files. Hoping to hear soon about the timeline for me moving classrooms. Something about switching grade levels is making me SO motivated to think about next year, and I'm sad that I have to work this summer instead of spending all of my time getting ready! Early this school year, I learned that one of my students' dads was in the Air Force and deployed overseas. As we approached Veterans' Day and learned about the holiday, I decided that we would write letters to her dad and some of the men and women in his unit. I checked with her mom, who sent in a picture so that the girl could show the class and tell them about her dad. I also asked her if there was anything that they would appreciate us sending. The class worked on letters, and brought in some of their Halloween candy to share. (I loved this- because, instead of their parents just giving, the kids were able to give something of their own, too.) I also asked parents if they wanted to donate nice toiletries, especially those like lotion and body wash. I had amazingly generous families this year. We had three boxes' worth (two large flat rate boxes of toiletries and one medium flat rate box of candy and letters) to send. We didn't hear back, but I didn't mind. I mean, I would guess that these people are a bit busy, and honestly, I didn't need to hear back to feel good about it. With her dad deployed, it was sometimes really tough for this little girl to handle. My dad died when I was 11, and so watching this little girl cry over missing her dad broke my heart even a little extra. There was at least one time where she stayed in from a special and she and I cried together. To be able to let her tell us about how proud she was of her dad, and how she missed him but she knew he was a hero, and then for her to see us rally around her family like that... well, let's just say that that alone made it feel more than worthwhile to me. So as the year went on, occasionally this little girl would give me updates about her dad coming home. He was going to be there for her birthday, and she was so excited. He was supposed to come home in March. Well, in mid-February, I got an email from her mom. Dad was coming home early, but the girl didn't know, and Mom wondered if they could come in and surprise her at school. They asked me what time would be convenient. Um, how about any time you want! So, we came back from a special, and I told the kids there was a surprise waiting inside- but they had to promise to stay quiet until every person was in the classroom and got to see what the surprise was. She was in the back of the line, and as we started to go inside, she strained to see the surprise like everyone else. When she first saw him, she was in disbelief. Her voice was soft and tentative. Bless her heart, she was so in shock that she wasn't even cutting in line to get to him faster. I urged her to go ahead, and she ran to him. He picked her up, and they hugged and kissed and cried, while the mom and brothers looked on and smiled. Her tears were one thing, but seeing him sobbing at holding his little girl again... I was tearing up. I was barely managing to hold it together, until they stopped for a moment, and the dad hands me a bag. He said that the guys in his unit had all pitched in. They so appreciated our little supply drive and letters that they got me a personalized, engraved glass apple paperweight. I was just flabbergasted. I had never in a million years expected him to give me something. Seriously, you are an Airman who was just deployed and you are thanking me? But- wow. How absolutely incredible. The things we lead our students to do can mean so much. I'm not sure that in the rest of my teaching career, I will ever have a day as powerful and amazing as this one. I will never forget the looks on their faces. As we honor those military men and women who have given their lives, I think of all those who missed out on the chance to have a moment like this. Someday, they'll get the opportunity. I'M MOVING TO THIRD GRADE! And even though I have to move rooms, it will mean 'starting over' in a new grade with new curriculum, and I've never taught anything but 2nd... I'm EXCITED! If I wasn't already trying to think about next year in my head, I definitely am now! Who are your favorite 3rd grade blogs that I might not already be following? 1. The clip chart. This was my first year in my own classroom, and to have the management piece so simple and yet so effective for almost every student has been terrific. I tweaked it to add "Sparkling" to the top, and I love the way it's so positive, focuses on achievement and not prizes, and the way this class has encouraged and cheered each other on with it! 2. My new school. I really liked my old school, but this school has been so fantastic about fitting me in to their groups and projects and ideas. I collaborated in groups for math and science, and a special Holidays Around the World unit, too! My colleagues and principal are so supportive and helpful at every turn, and feeling like they all believe in me (particularly my principal!) has made a huge difference for me. 4. My projects of the year- the postcard project, pumpkin book reports, turkey landmarks, recycled Valentine holders, writing books, leprechaun traps, eggshell science, Mother's Day gifts, and the lemonade stand- all turned out great. 1. Math. I do think I taught it well, but I had such high hopes for a weekly graph, and using the math journal weekly, and doing math centers regularly... and those never happened. Plus, in my efforts to teach it better, I didn't plan ahead of time well enough- and ended up running out of room for our last few chapters. I need to figure out how to best differentiate, too- maybe guided math or adapted Daily 5? 2. Handwriting. Ugh. I always plan on doing it, and then it tends to lose out. We're supposed to do handwriting, but they're working so hard in writing! I could really use a little extra time for ____! Our read-aloud was inspiring some really good conversation so I kept going! Excuses, excuses! I need to figure out a way to fit it in that I find valuable enough to not just skip! 3. Time management, especially when it comes to grading. Finding Engrade was good, but I need to have more willpower and keep myself more accountable! 4. One tough kiddo. At my last job, I was an interventionist, so I thrive on pushing and pushing and watching the data go up. Well, with this one... it just wasn't happening, and there were a lot of factors at play that have made it very difficult to figure out how to best handle the situation. I know there will always be kids like that, and it's not my fault, but it's still one of the things I'm most 'down' about. 1. Writer's Workshop. My kids love writing, and most of them have come a long way- but I need to structure my teaching more. It was honestly pretty random this year. 2. Reading. Guided reading lessons happened at the beginning, and again at the end, but not throughout. Centers were good and manageable, but could surely be better. I loved my classroom library- except the fact that it never got organized. The cheap book boxes have been great! The most important thing, though- most of my kids LOVE reading now, even if they didn't before, and the skills have continually improved. 3. Science and Social Studies. When I did them, they were GREAT- but it wasn't enough. I hope I can plan this a lot better to tie in with our reading stories this summer, and plan ahead so I don't let it fall by the wayside during the year. Science is my favorite to teach, so I need to make sure it happens more! 1. I have a lot of new followers, so I tried to link to previous posts when it made sense. Click away on pictures or links! 2. I caught up on over 1000 Google Reader posts this weekend, and while I took a break near the end, I shut down Firefox with 70 tabs open... and it crashed. So, um, I guess I'm not making it to those to comment. Sorry! 3. I end school in 3 days, but still don't have it confirmed which grade level I'll be teaching next year. There are 8 of us in 2nd right now, though, and only 7 2nd grade class lists for next year, so someone is probably moving, and if it's me... I want to know already!! 4. My husband hasn't been gone a week and I miss him a lot. I know, it's lame. Link up with Amber at Adventures of a Third Grade Teacher here! I am loving reading these, because everyone is sharing such great ideas and things to think about changing for next year! We spent our morning learning about capacity while we made ten gallons of lemonade (2 5-gallon jugs). We learned about concentration and that we had to make sure the lemonade mix dissolved. We also taste-tested to see if we thought the concentration of our solution was too low, too high, or just right. We made the final copy of our menu (we had made a rough draft the day before on chart paper, but they really liked the idea of using a chalkboard "like a real restaurant"). I wrote the small parts, but otherwise... all kid-done! We decided who would work what jobs, what shifts. As it turned out, most of the students really wished they had more time to work. We originally had made signs for the lemonade stand (after examining persuasive advertisements- freebie here! ), but the principal asked that we only sell to adults, so we didn't put many of our signs up around the school. (It didn't seem fair to advertise it to the kids who couldn't have any!) So instead, we used our signs to go around the table. We were BUSY. We had a line before we could even get set-up. Next year, I think we'll be doing most of the set-up before lunchtime, just so that we don't have as much to do to get selling! My husband was amazing. We were in between the time he was in classes, and the time he left for his internship- and he spent the entire morning running around town to pick things up for us, and then helping mix up the lemonade and helping run the stand the rest of the day. Not sure how we would've done it without him- and the students all voted that he should get a free cookie for his troubles. You can see how busy we were. We had our lemonade stand during a mile run-walk for the whole school that many parents attend. We are a big school (7-8 classes per grade level, K-3), so this meant a lot of customers! We even had some special customers, like the principal, superintendent, and the MAYOR- thanks to my students writing friendly letters to invite them. They were disappointed that Barack Obama didn't make it, though. We sold just about all of our ten gallons of lemonade. We had also written business letters to local places- and our local Subway donated 250 cookies and 200 cups, our local BP donated plenty of large bags of ice, and our local Walgreens donated all of the lemonade mix AND a volunteer while the lemonade stand was running. She's in this picture on the right, and really pitched in and got involved helping to watch over our cashiers. All in all, with the help of parents, local businesses, and our two guest speakers (a local entrepreneur and a publicist who helped us write a news release), we ended the lemonade stand making almost $350 for Henryville Schools to rebuild after being hit by a tornado. Haha- just kidding. We didn't put this one up, but one of the girls in my class made it at home from a Diet Pepsi ad. Didn't you know, Sofia Vergara loves our lemonade? It was a huge success. HUGE. Not only did we make a LOT of money, but the amount of academic learning packed into the project was amazing. Plus, I had the kids write about it and got to read things like, "I learned that just 'cause I'm small doesn't mean I can't do big things." I am so proud of the kids for being so passionate and convincing me to give it a try. I am proud of myself, to be honest, for taking it on even though it's the end of the year, my first year teaching my own class, and my first year at this school. Yes, it was a lot of work... but if you ever get a chance to dive into a big project like this, DO IT! So worth it! One of the best things about the end of the school year is that I feel like I can vary from our normal routine. And, honestly, the kids love it. We read this book (picked up from a library book sale), which is pretty good. It's written with a very primary story- a bear family going on a hike- but the information is good, and the pictures of rocks are good. Plus, my class cracked up at the rock puns. Then, we got the rocks out. Almost all of them are ones I just picked up outside a few years ago (but a couple have been given to me by students). While I did let them sort by sedimentary, igneous, and metamorphic, first I just wanted them to sort by different qualities. We sorted by color, luster, hardness, weight, size, shape, and an attribute of their choice. Then, we circled around and took a guess of what each group might have sorted by. Of course, we tried to identify them as what type of rock they were- but some were hard to tell, so I mostly focused on them being able to justify their answers. It was a simple, simple thing to do- but so much fun. They were so engaged- the whole time. And the teamwork required- ohhhh, it was interesting. Most of my groups made me so proud- really using the things I've taught them to solve conflict and make decisions... and one person had to sit out for a little while. But most of them were great! Kids will start to notice even the plainest of rocks. You should have seen all the rocks they showed me on field day! I love when something we learn about makes them think outside of school, especially right before summer break. We only have FOUR days left of my first year in my own classroom! Husband is in the middle of a monster road trip, somewhere in Arkansas, on his way to Texas for the summer. I have a field trip to go on tomorrow, and then report cards to do, class awards to decide, files to update, assessments to grade, gifts to make, and a class to corral for FIVE. More. Days. Tonight, I should have been productive but I wasn't. At all. And it felt gooood. Life is moving FAST right about now, isn't it? So, Wednesday of last week, I decided that a better Mother's Day idea for my class just wasn't coming to me, and I decided to go with an easy one- flower pens. Basically, get some fake flowers. Pick out the best looking ones. I find that I do well at Dollar Tree, but I hear that these are easy to find at thrift stores, too. I get 5-6 flowers for a dollar, usually. Start out by bending each flower away from the bunch. Because these flowers do still have wires in the stems, I used a pair of scissors to cut the plastic. Then, I just bent the wire back and forth a couple of times until it broke. Keep doing this until you have eleventy-billion flowers. For me, I wanted my students to choose 2 flowers each, so I went a little crazy. They were so cute- some even knew their mom's favorite colors or flowers! Now, find some pens. I snagged most of these from the "parent donations" bin in our supply room. Smoother pens are better, but any will do. My sample was made from an old hotel pen. Check that the flower stem is not longer than the pen (and re-cut if it is). Then, start wrapping the floral tape around the pen a few times at the top. Floral tape is a little stickier on the outside of the roll, usually, but it's pretty hard to tell. It will stick either way, but not immediately. Starting the tape on the pen was the hardest part for my students! Once you have it around the pen 5-6 times, stick the flower stem next to it and wrap tape around both, together, at least 4 times. Floral tape will stretch, so be sure you pull it tight. From here, pull the tape and rotate the pen! At the bottom of the pen, pull hard enough to tear the tape and then press it down. It will stick to itself. My favorite thing about this project is that, when I first showed the kids, they gave me this look like, "Yeah right! I won't be able to make it look like THAT." And then, really, most of them did! They were so proud when they were done. My worry the night before was how to make this look presentable. After Dollar Tree, my next stop was Hobby Lobby, where I found the floral tape for less than two dollars and the "vases" for 40% off. They're can coozies! I just hot glued a cute piece of ribbon around each one. Ta-Da! These make great easy gifts that the kids can really make. I know Mother's Day crafts are over and done, but a bouquet of flower pens could make a great end-of-the-year gift for the school secretary who essentially runs the school, that Title I teacher who works her tail off, or those room moms that deserve a little something extra. The kids really enjoyed this, and I helped small groups through it as the rest worked on writing a short essay about what makes their mom so great. I was pretty happy with how they turned out, and I like that it's a practical gift a mom (or grandma, or important female in their lives!) can really use.